‘Ex-services personnel make up 25% of the rough sleeping population’ stated a business leader to me at a recent event with what a colleague caustically referred to later as ‘the unerring certainty of the terminally ignorant’. His pronouncement came to mind as I was reading the latest CHAIN annual rough sleeping figures for London which show that 9% of the rough sleeping population were formerly in the armed services; 3% in the UK armed services and 6% in the armed services of other countries. I spend an inordinate amount of time talking to groups and individuals about rough sleeping and invariably the conversation will coalesce around two questions: who and why? Around both swirl myths and misconceptions. The antidote to the plausible but unsubstantiated anecdote upon which, distressingly, policy decisions are occasionally based is the CHAIN report and data which is unique in terms of the richness of the information and its reliability. The data is compiled cumulatively by outreach teams and is ‘real time’ data, inputted by individual outreach staff during a street shift. Over the year a remarkably full picture of the rough sleeping population is built up. CHAIN figures show that there is an extraordinary flow of people onto, and from, the street. In 2014-15, 5,107 people were found sleeping rough in London for the first time. Over the same period 2,624 men and women were helped into accommodation or to return home, a big figure we seem coyly reluctant to highlight. Curiously, a prevailing myth is that outreach workers only stick to areas popular with rough sleepers. From this a further assumption emerges, that certain sub-sets of the rough sleeping population who seek to sleep on their own in out-of-the way places remain hidden, overlooked, perhaps disregarded. Young people and women are often mooted as examples. This is based on an anachronistic picture of outreach teams working with cardboard city-size congregations of rough sleepers in parks or huddled together in shop doorways, which is how it was when I was an outreach worker in the 1980s. Nowadays, a ‘hotspot’, the term given for a visible site where rough sleepers can be found as a group, can comprise as few as three people. 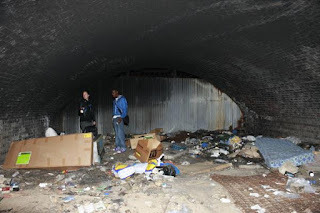 Instead, outreach workers frequent derelict buildings, tunnels, night-buses, tower blocks, car-parks, canal boats, tow-paths, riverbanks and woods. The dispersed nature of rough sleeping is one of the most significant changes witnessed over the last decade. Yet some things don’t change. The latest figures show that 45% of rough sleepers have a mental health support need, a figure that has been consistent for over ten years. There are around 600 people sleeping rough in the capital with severe and enduring mental health problems who have been on the streets for at least a year. Why this large number does not create outrage is difficult to fathom. It may be because of another enduring myth; that people with mental health issues are eccentrically choosing a street homeless life-style and should be left alone to get on with it. The endearingly whimsical notion of the ruggedly independent rough sleeper certainly fits the fable which grew up around the legendary Anne Naysmith, who slept rough for many years. The mental health professionals I have spoken to who knew Anne well see things very differently, believing that the psychotic episodes she endured were brutally debilitating. Anne feared that malevolent spirits would punish her if she left the street and occasionally her anxiety was such that she would be found weaving amongst the traffic on busy roads. Earlier this year Anne tragically lost her life when she was hit by a lorry. Beyond dispute is the remarkable change in the nationality profile of rough sleepers. The latest figures show that 57% of London’s rough sleepers are non-UK nationals. With limited rights and fewer options to escape rough sleeping, non-UK nationals are especially vulnerable and sleeping rough brings enormous risks. And, when the numbers have been pored over and the reports compiled, there is ultimately only one justification for this obsessive scrutiny and that is to make rough sleeping in 21st century Britain a historical abnormality which, in time, will seem as incongruous as our ancestors’ sufferance of bear-baiting. Last month, a Polish rough sleeper with severe alcohol dependency problems which led him to persistently reject offers of assistance was found dead on a dirty mattress on a canal tow-path. The mattress has already been requisitioned by another rough sleeper. Acquiescence is not an option.